DOES: I don't know if this is more beauty than brains or more brains than beauty. If Quadrilla was a person, she would be a supermodel that graduated from Harvard. He did great didn't he? Dad studied mechanical engineering. That may have helped but Number 7 does alright for himself. 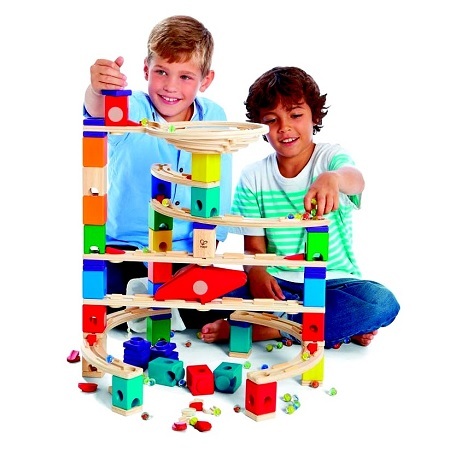 While they are gorgeous and sometimes pricey, I kind of feel bad for makers of wooden toys. These toys are so beautiful and somehow we are fooled into believing that wood is the best, wood makes smarter children, wood is for discriminating tastes and that would reflect of the family too. 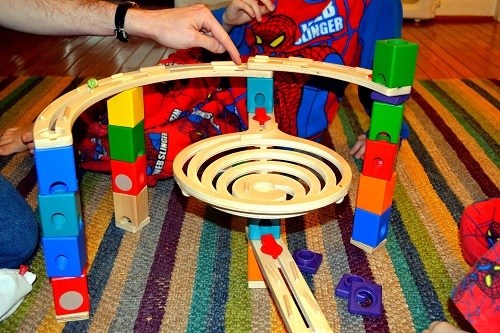 Luckily, I had a nice wake up call one day when I discovered a wooden marble run at a flea market. For only $5, I could take home something gorgeous and perfect for my little one, then 3 years old. But when I started putting it together, I realized that it was one of the WORST toys ever made. And it gets extra bad marks because it was wood and it was beautiful and it looked high quality but ugh... what a piece of JUNK! It kept falling apart and my little guy got so upset. I tried to glue it but that only made it worse. You wouldn't know it at first but the force of movement stems from the angles within these connectors. 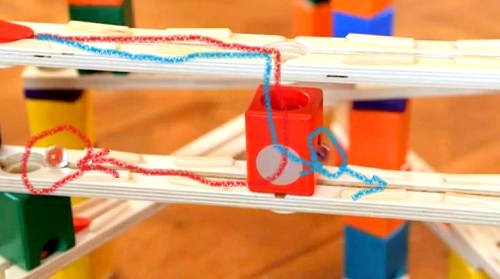 So to make adjustments, you can usually get away with just changing connectors instead of the whole track as in conventional marble runs. This Slide + Accelerator really does its thing! 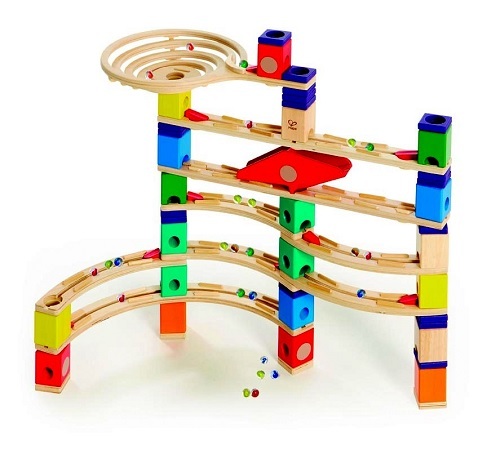 I've never looked at wooden marble runs ever again until I attended the Toy Fair. I had a chance to meet Wilfred Braun an inventor, who was showing me the Twiddler which he had designed. I was enthralled. We'll talk more about Twiddler once it is made available but he told me that the design of the Twiddler has much to do with the Quadrilla, which he also invented. Twiddler is so 2D but Quadrilla is so 3D. How could this be? 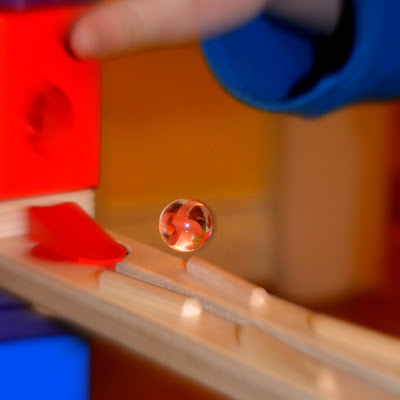 Moreover, unlike other marble runs, the tracks are either parts of a circle or a diagmeter of a circle. Also, the tracks are flat. I don't mean just straight. I mean completely level as in parallel to the floor. If you put a marble in the middle of a track, it would go nowhere. So all the power behind the movement comes from the drops engineered inside the connectors. How do you know how each connector works? You have to test it out. Just put a marble in and let it go. Some people learn better this way. To put the Quadrilla to the test, I asked Number 7's family to give it a try. Number 7 is a multi-talented maker. Celebrate Slow-Cooked Learning with an Xcellerator? What? These days there is so much discussion on test-taking in schools and though the process may be well-intentioned so many folks are dissatisfied and many just downright reject it. My kids are still on the young side and so we haven't really felt the pressure yet I see the looks on everyone's face when someone mentioned the word "homework." And I would bet that nowadays parents hate homework more than the kids do. To me, if we lived in a perfect world, playing with toys like the Xcellerator would be a smart homework assignment. Why? Because one of the greatest things we can teach our children is to be able to problem-solve. When they gain confidence in this ability, they will be less anxious. I often forget that I must convince my children that they have the ability to problem-solve ANY situation. But you can't just tell it to them. They need the setting and the tools (and the time) to learn it on their own. I bet you that if learning was done that way, it would really penetrate one's memory. Just like the way slow-cooking makes sure that everything is cooked. On the outside, you can't see what this connector will do. You just have to figure it out. Kids and parents could find that it is a little time consuming to have to figure out which connector does what via this method. Conversely, I think some kids and parents would also prefer to be surprised. I wonder if Hape would consider giving a little hint guide just to explain the three connecting pieces shown in this review. Should your child choose Challenge #2 and succeed. He will have taught himself something and will have gained a truckload of confidence because he chose the path with no clear answer. I think that is a braver choice. But look at this set. 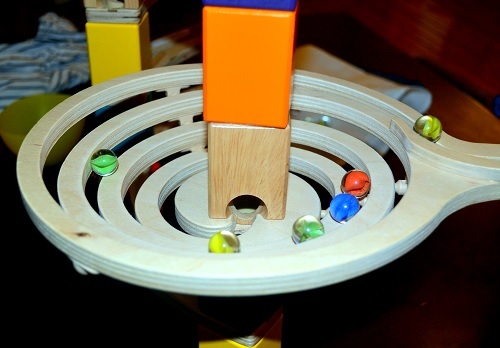 The wood is smooth, the sounds of the marbles are rewarding and the colors are cheerful. Even though there is no clear answer, it's okay because the kids know they will enjoy the journey. I mean, c'mon, it's called an Xcellerator! What could be more appealing? At the Toy Fair, Quadrilla inventor Wilfred Braun told me that the power running the marbles comes from these connectors. I had no idea. That is very different. Wilfred Braun, who stopped building T.V. and radio stations to make toys for his 4 year old son and then went onto enchant children all over the world with his Quadrilla marble runs. This set costs around $150 and for sure I have spent at least 3-4 times that amount on workbooks and CD-roms. (most of which were never completed). In retrospect, I kind of wish that I took part of that budget to buy my kids a Quadrilla set. I knew it was beautiful but I had no idea how special it really was. This is the kind of learning that we all long to have more time to do. Additionally, Number 7's mom hopes to see her son plan something prior to building it. She thinks it would be helpful to executive functioning skills and I totally agree!!! Wouldn't it be so cool if there was an app that would build it and simulate the run for you prior to building it? I suppose that it could be really hard since most ball run apps are only 2D. Still, nothing beats the multi-sensory learning opportunities presented in the Xcellerator. I have a feeling Number 7's family will be playing with it for a long long time. Now's your chance to win your own Hape Quadrilla Xcellerator. MSRP $149.99!!! Want to buy it on Amazon? Then please use my link and support Toys are Tools. Disclosure: Toys are Tools was not compensated by the manufacturer for the publication of this review. The product was provided to Toys are Tools to facilitate a review. Reviews are never promised. The giveaway prize is being donated by the manufacturer. Million Dollar Question................ What do you think about homework? Too much? Too little? How much time do you spend? How much time does your child spend on it? Answer this for more Rafflecopter entry points (enter above)! We want to hear from you!!! LOL! Homework only in moderation! Good if practice is needed. My son is in 1st grade so homework isn't a struggle yet. My twins are in kindergarten, so homework is not a big deal. One of my twins has autism - so no homework at all! I almost wish he had it, as he would be closer to his peers in this area. The other twin has homework, but it is pretty minimal and the teacher doesn't seem to care too much if we skip it one night here or there.